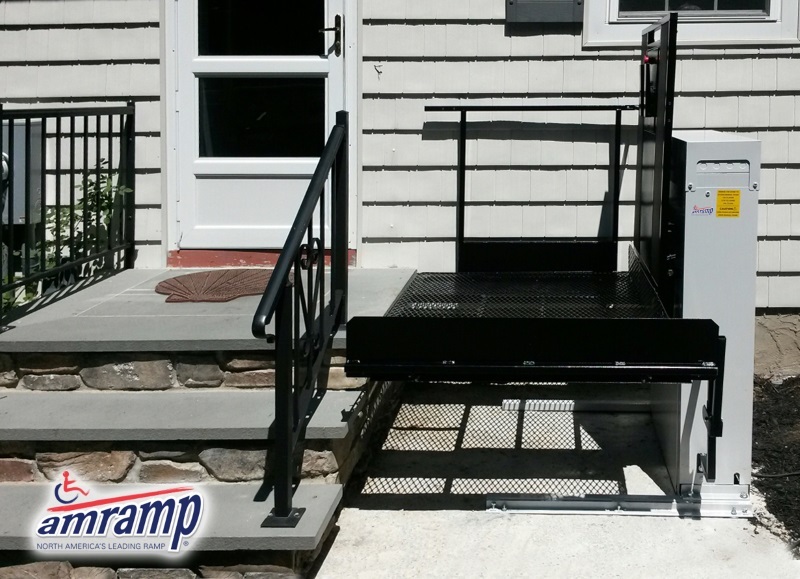 Serving Long Island, Amramp provides accessibility solutions for homes and businesses including wheelchair ramps, stair lifts and vertical platform lifts. Amramp’s trained professionals provide FREE on-site evaluations, whether it’s a residence, church, school or business. 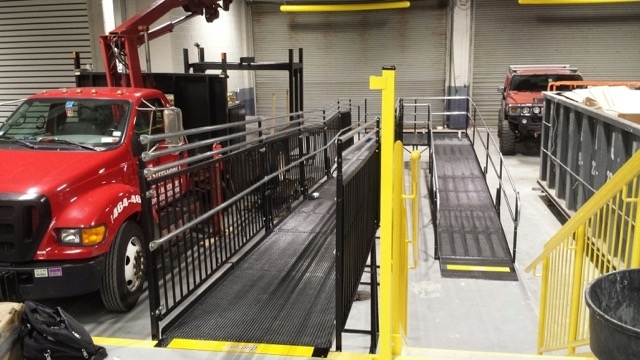 Yes, Amramp also accommodates the construction and commercial industries offering ADA wheelchair ramps for purchase and RENTAL. 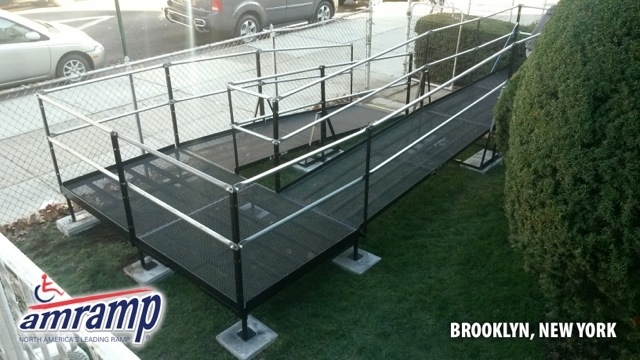 Amramp is the nation’s leading provider of accessibility solutions and steel modular wheelchair ramp systems. 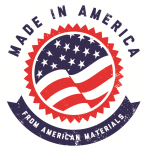 Based in Copiague, NY, we are a local company with a fully stocked warehouse, ready to meet your needs quickly. 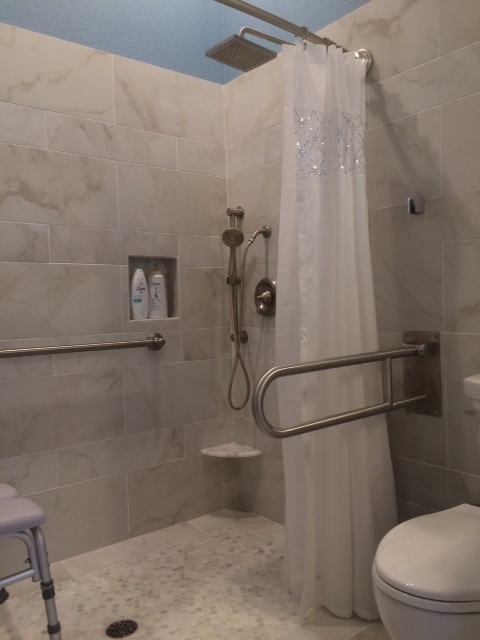 No matter where you live on Long Island, our Copiague location enables us to meet your needs quickly: Accessibility solutions can be installed within days. 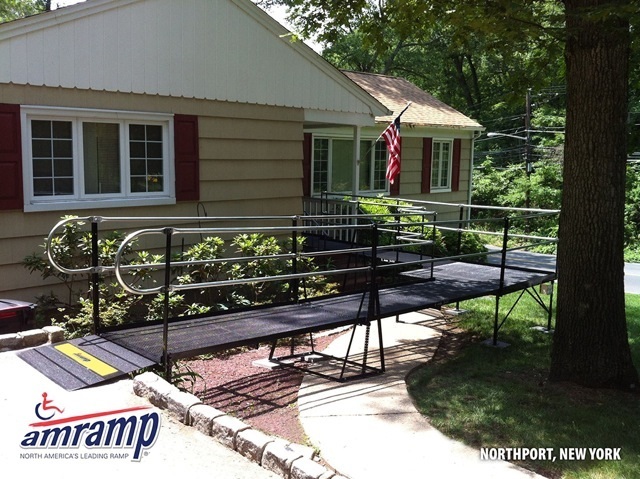 Amramp is a national provider of modular wheelchair ramps and portable roll-in wheelchair showers. The Long Island franchise is owned by Bob DiGiovanni. Bob and his team meet with each Amramp client/family to design a safe and usable wheelchair ramp for people using wheelchairs and scooters. 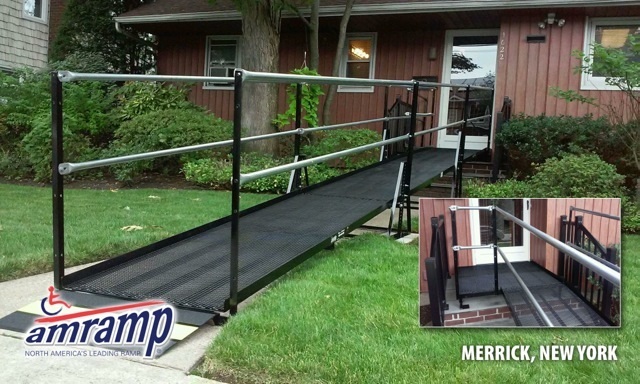 But Amramp offers more than just wheelchair ramps. 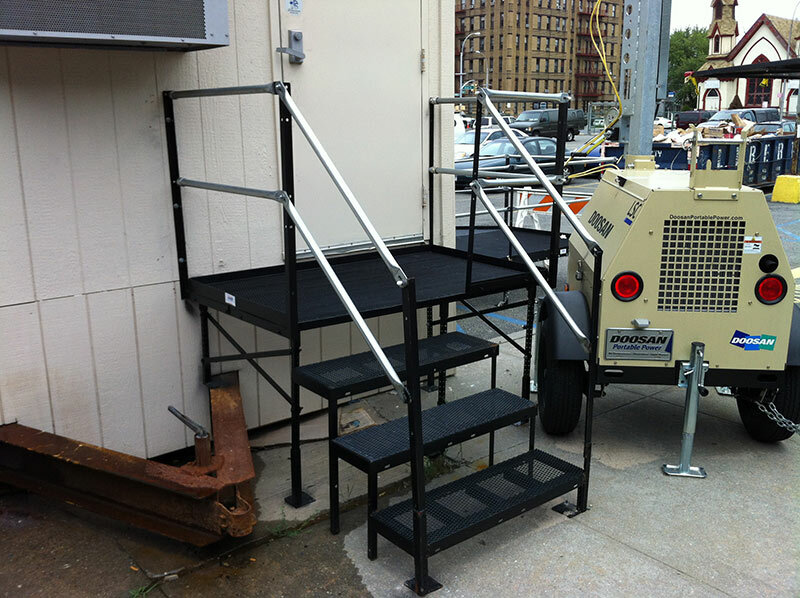 Amramp Long Island operates a fully stocked warehouse; our professionally trained staff usually delivers a ramp in hours, not weeks or months! FREE home or business assessments: Call today! 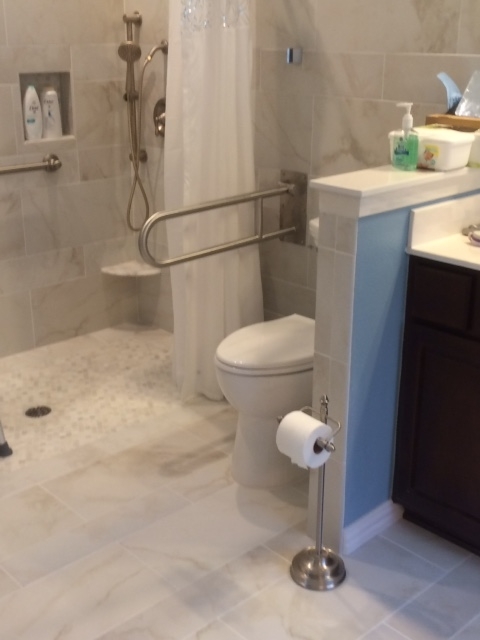 It was a pleasure to work with you regarding the installation of a ramp for my home. I appreciate the time you took to explain the features and care required to maintain it. 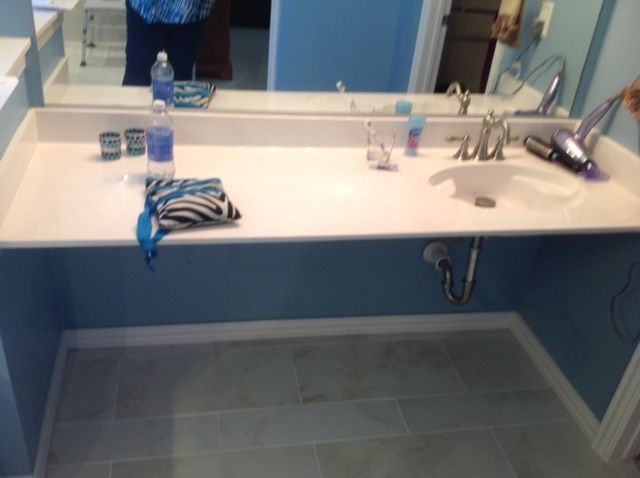 The appointments were punctual and your workmen did a good job with the installation. The access provided for my husband is making a great difference in improving his quality of life. Thank you again. Couldn’t ask for a more professional and efficient team! I am writing on behalf of my 94-year-old mom, who has lived in the same home for the past 60 years. About 5 years ago, it became clear that mom would need a safe way to navigate her front steps to avoid a potentially life-threatening fall. She wanted desperately to remain in her home. After doing online research, my first call was to Amramp, and I knew immediately we were in good hands. 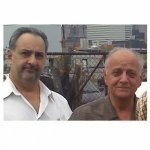 Bob and Frank, the owners of the Long Island franchise were family, and I was instantly aware that they were not dealing with me only as a customer, but as a daughter who wanted to keep her mother safe. 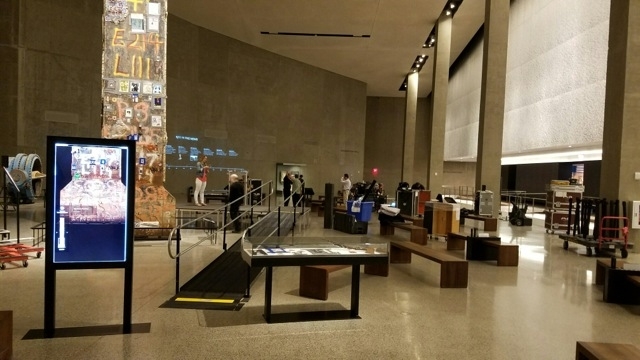 They responded quickly with an estimate, proposal for a ramp and handrails that would work, and the installation came very soon afterwards. 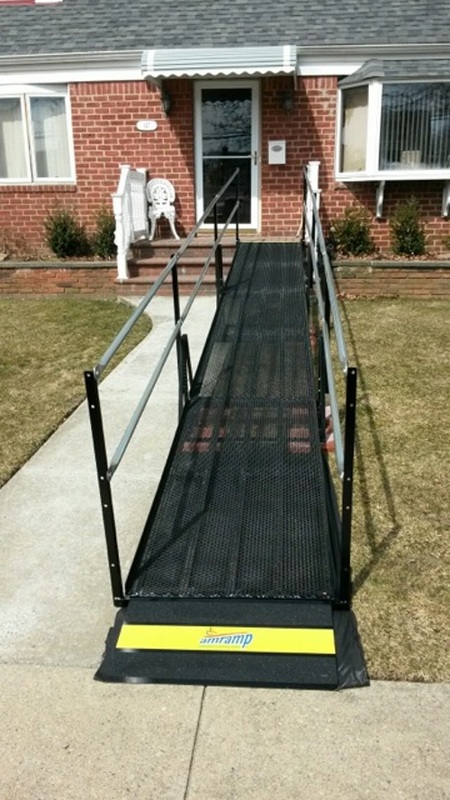 Not only did the ramp work for mom, but added to the quality of her life, since she used the ramp platform to sit and read and could more easily see the road and neighbors walking. It absolutely a blessing and allowed her an additional 5 years in her home. I want to thank Amramp for being the solution that improved my mother’s life and gave me peace of mind. Every once in a while, I come across a company that stands out in terms of the quality and service they deliver. Amramp was one of those companies for me and my family, and I thank you from the bottom of my heart!! 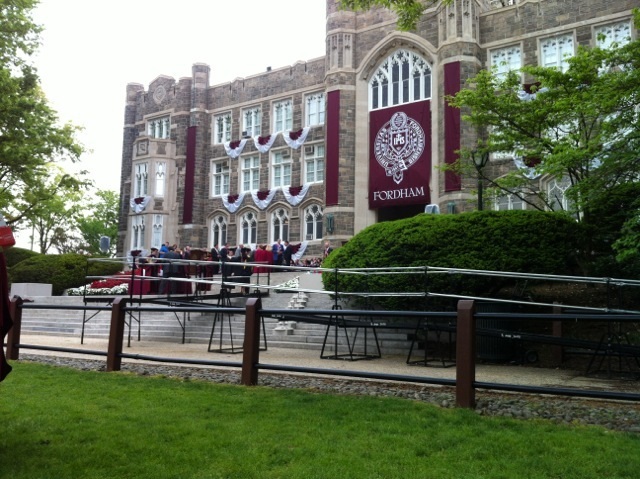 We are getting use of the ramp and every healthcare professional that walks through the back is impressed by the setup. Non slip in the rain and inclement weather. We did this right!! The salesman was a pleasure to deal with. You gentlemen and Amramp were a tremendous help to our church, specifically to the physically limited people of our congregation. 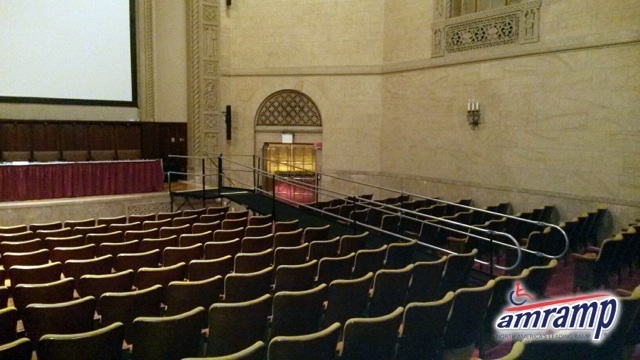 A steep stairway leads to our main auditorium on the second floor. We had a chairlift that was 40″ too short, which you were able to correct for us. Thank you for adding 40″ to our chair lift rail, making it usable for our church. You worked very hard, competently wiring, joining together, and aligning the section that was needed. Thank you for your professionalism, kindness, and craftsmanship in the great work you did for us. The chair lift continues to work well. Just want to drop this note to say how great the ramp has been this challenging winter. If the rest of the walkways were as easy to clean as your ramp, I would only need a broom. Thanks for planning out such a functional ramp for my aunt. She tried it out today and it was very comfortable for her to leave and enter the house. I also want to commend Jose for his workmanship; he works very professionally and wants to make sure the customer is satisfied! He is an asset to your team. We would not hesitate to recommend Amramp in the future! I just wanted to say thank you very much for your services. The ramp is my families’ life saver. I am able to get my mom in and out of the house using the wheelchair or walker with no problem at all. I am so, so, very, very happy. I have already been asked by my neighbors, who what and where, did I get the ramp. Don’t you worry I will spread the word indeed. Excellent service and perfect gentlemen. Again, thank you… this isn’t easy for me, doing it all alone but when I get help like I did from you and your partner, I am truly blessed. I sincerely thank you. Joe has been home for a week and a half now. I must tell you how pleased we are! Joe is amazed at what you were able to do and is so grateful. Sincerely and truly thank you!!! And you were right, with this crazy weather the materials are so sturdy and slip resistant, we are so impressed!!!!! Also the Visiting Nurses Services that has been providing services to Joe since he’s been home is also extremely impressed with your ramp. I am sharing how wonderful, compassionate and professional you and your office was to work with and honestly your product speaks for itself. Again Frank, I am so grateful to you for coming to my assistance in such a short time. You are among those angels that have helped Joe and I get through this nightmare that we are in and I thank you! 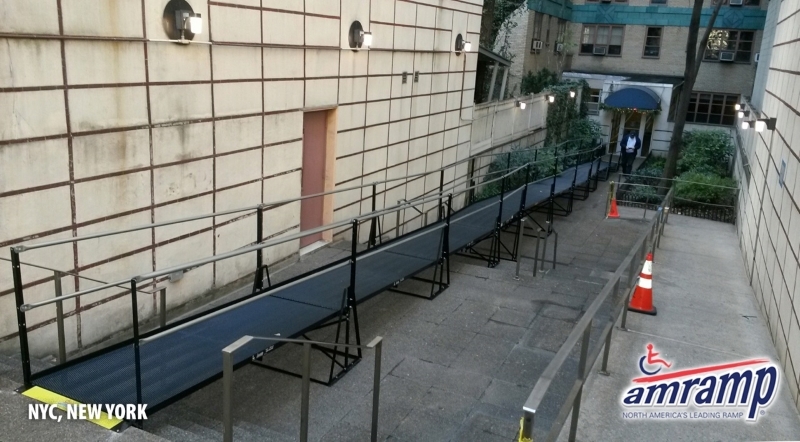 We recently needed to rent a ramp – one call to Amramp and our problem was solved. Not only did you deliver on time, but you graciously left it in place for a couple of days beyond the removal date – and sure enough, I needed it for another month. Both installation and removal were done quickly and neatly. Thank you so much for your consideration of our needs. 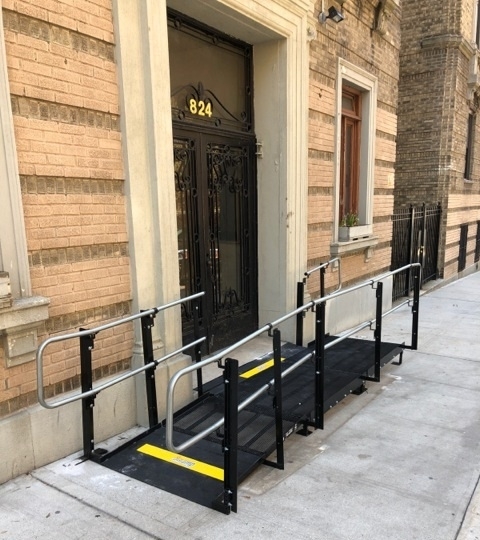 Hopefully, we won’t need a ramp again, but if we do or do any of our friends or acquaintances, we will surely know who to recommend. Thanks again. Your installer was fantastic, responsive and neat. It has been a total please in dealing with you all. They say ‘Customer Service’ is key – well you guys definitely have that. We will tell we know about Amramp.